Early British colonial settlements in Ireland and North America occupied a parallel and overlapping universe, so intimately connected that in the early seventeenth century, the chronicler Fynes Moryson would refer to Ireland as “this famous Island in the Virginian Sea” (Moryson 1605-1617). Drawing from a range of archaeological projects in both North America and Ireland, the lecture will consider the similarities and dissimilarities between the two lands and the cultural entanglements of the early modern Atlantic. Familiar places like Roanoke, Jamestown, and Plymouth will be discussed in light of their lesser known Irish connections, while the long held notion that Ireland served as a model for New World English colonial ventures will be challenged. Audrey Horning teaches in the Department of Anthropology, College of William and Mary. She received her PhD in Historical Archaeology from the University of Pennsylvania. 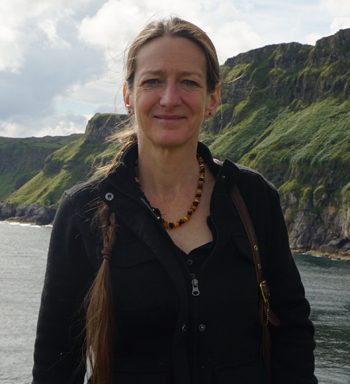 She has taught in northern Ireland and England as well as in Virginia. Her excavations have centered on the island of Colonsay but she got her start in Jamestown. My research centers on comparative colonialism and the relationship between archaeology and contemporary identity, with a particular focus upon European expansion into the early modern Atlantic world(s).Recent publications have addressed future directions for historical and contemporary archaeology; integration of archaeology with conflict transformation; ethics and public engagement; incorporation of Native American perspectives on colonial histories; the anthropology of drinking in colonial settings; late medieval Gaelic Irish rural settlement; vernacular architecture in Ireland and Virginia; and the 20th-century archaeology of Appalachia. She is the author of Ireland in the Virginian Sea: Colonialism in the British Atlantic, Ireland and Britain in the Atlantic World , and Crossing Paths or Sharing Tracks? Future Directions in the Archaeological Study of Post-1550 Britain and Ireland, attesting her interest in Ireland and its connections with the larger world.